We do it to stop time. I couldn't help it. I simply had to try and improve on the icicle photos I'd made a few minutes earlier. 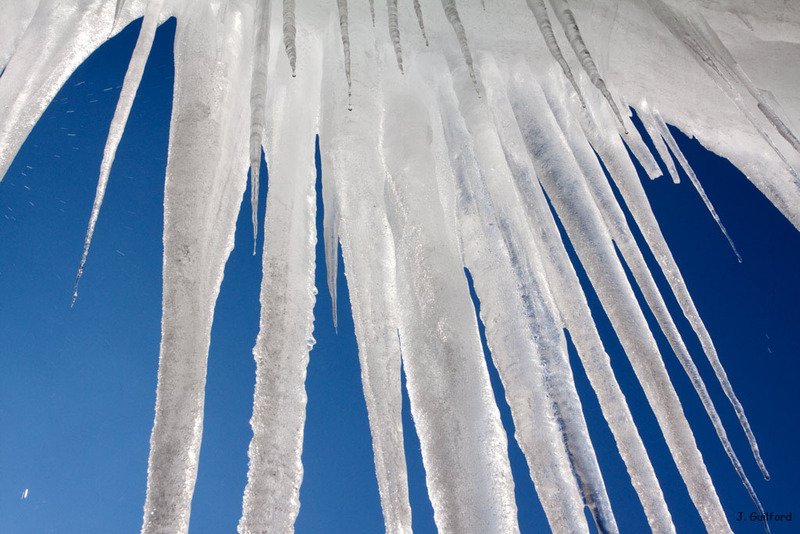 So I hauled out my best camera and shot a few more photos of icicles dripping lit by the day's unexpected brilliance against a shockingly blue sky. I checked my first "second" batch and found the lens had been spattered by drops of water striking the window frame. I blotted the offending drops off the expensive glass and tried again. I guess this was more like a third try. As I write, I hear occasional crashes as the stalactites lose their grip and fall to shatter against the ground. We photograph to preserve the ephemeral; we do it to stop time. This is an amazing photograph. The blue sky behind the ice…brilliant. This was definitely worth all of the trouble you went to to get the shot!! Bravo!